After leaving Santa Cruz the Beluga sailed North to the area of Santiago Island. Our first port of call early in the morning was a small volcanic island called Sombrero Chino (or Chinese Hat). It wasn’t difficult to see where it got its name. The trail that we walked on the island was pretty short but ended at a rocky wave cut platform covered in marine Iguanas. In the waters around the island there were sealions playing and we had to walk off the path at one stage to avoid a bull sealion plonked right in the middle. The island itself was formed of lava and we walked across a number of very small lava tubes – where the lava outside hardens leaving a tube for the lava to flow through. Returning to the boat we only had a few minutes to get ready for a snorkelling expedition where we dropped into the water next to a lava flow on the main island of Santiago opposite Sombrero Chino. We’d been in the water for a few minutes when a blurred streak came flying past us. We waited where we were and the penguin flew past another couple of times chasing small schools of fish. 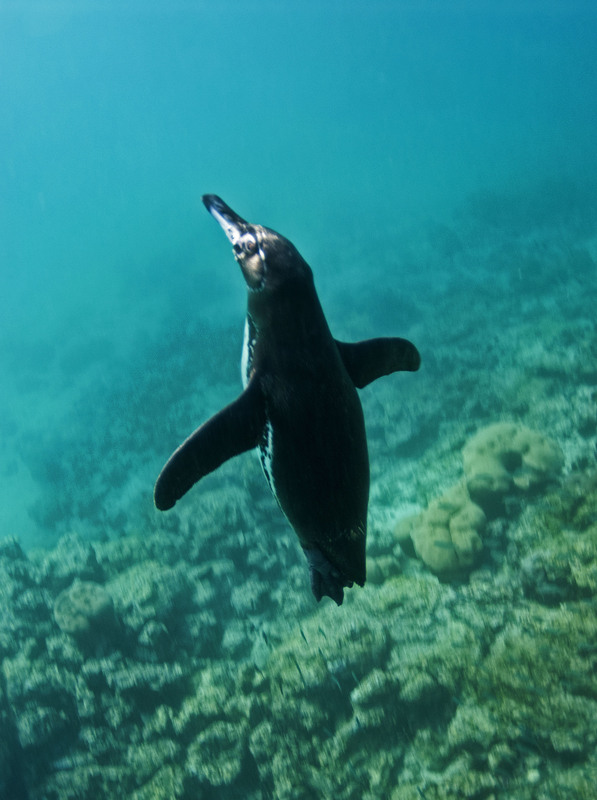 The Galapagos penguin is the only penguin found in the Northern Hemisphere – although of course we were still in the Southern Hemisphere. We returned to the Beluga for a quick bite to eat and then we were back in the water in Sullivan Bay on Santiago Island for another snorkelling session. People were getting tired by this stage of the trip and only a few people hit the water. 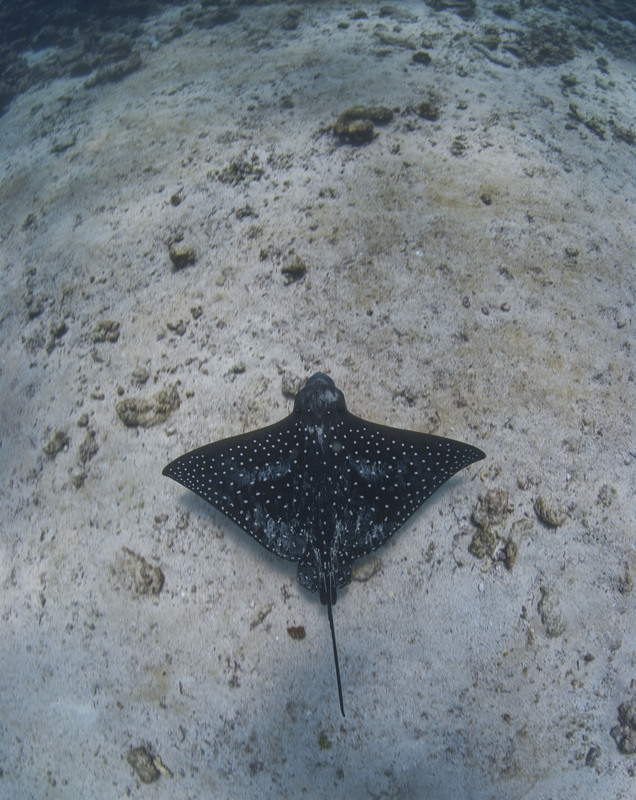 This was a mistake because we were treated to more penguins, a marine iguana eating in the water and some eagle rays. The penguins hunted around me for around 5 minutes and at times I could see three at a time. They move incredibly fast through the water but still seem to have a hard time catching the little fish that they are after. At around 4.30pm once the harsh sun had started to cool down we headed off for our second land excursion of the day. Landing on a desolate lava shore we hiked inland across a cracked and rough lava surface. 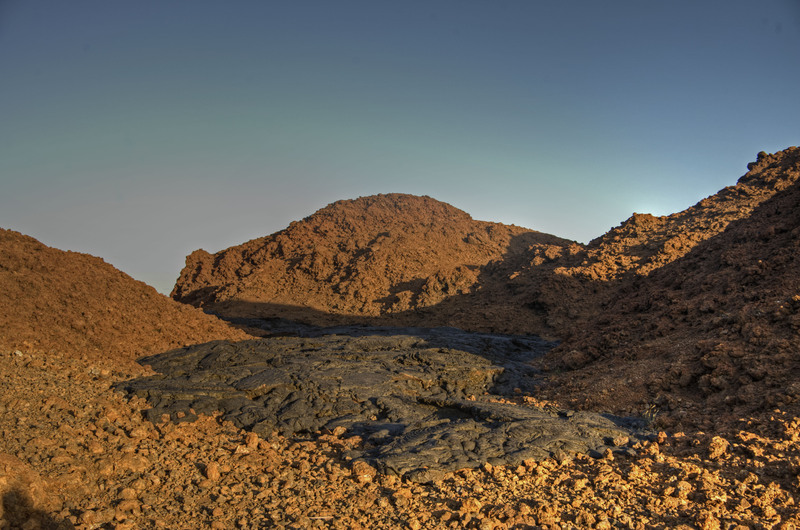 The lava was still radiating serious heat but the sun was sinking low on the horizon. I think it would have been unbearable in the heat of the day. The lava flow from 1897 is a pahoehoe lave flow which means it has a ropey surface caused when the surface lava cools and is then rippled by the flowing lava underneath. The point of the excursion was to search for the early adopters on the lava. These were some weed and a type of small cactus. 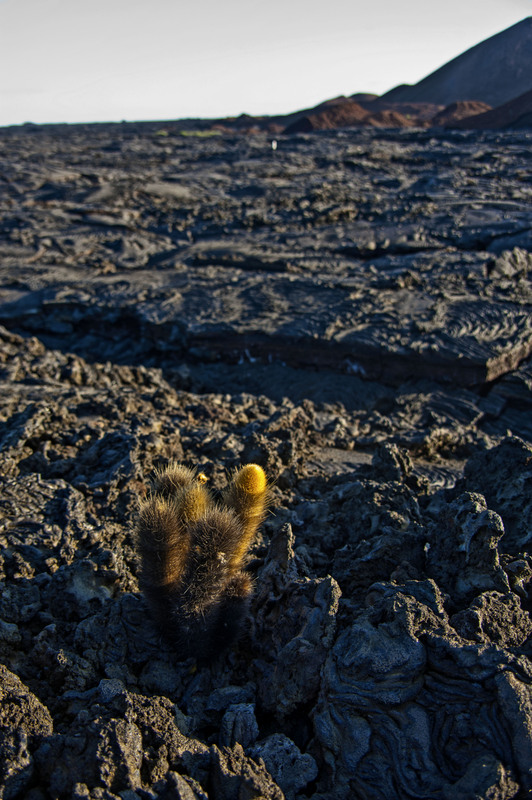 Over merely a few million years these will allow a barren lava field to turn into semi-fertile vegetated land. 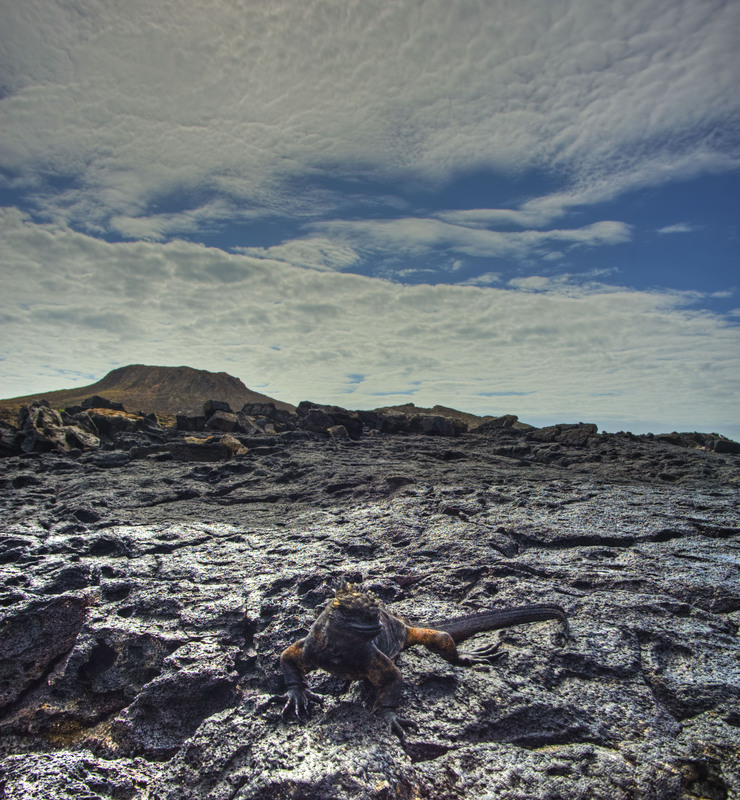 The only things we saw living were some marine iguanas on the shore, a couple of lava lizards and the odd bird exploring the area but who were not resident. There is much more to Santiago than this in the areas not affected by the lava flows but we did not visit these areas. 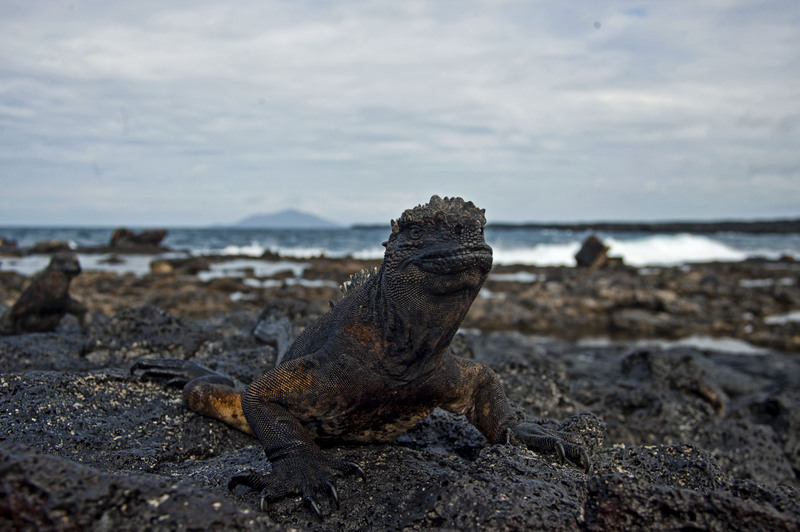 Your photos of the Galapagos are fantastic! 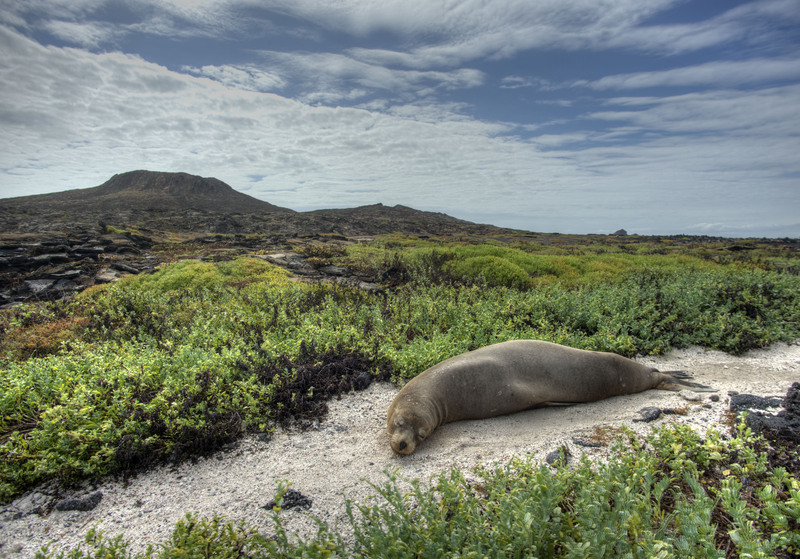 Would you recommend the Galapagos Cruise for a honeymoon? I’m thinking of planning a September trip to South America. I hope all is well in the Orion world. 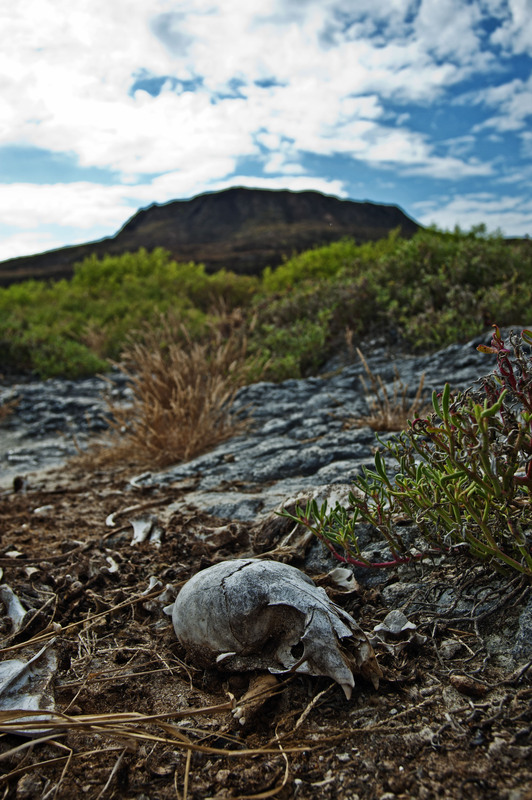 The Galapagos is an amazing place. Very expensive though. Its definitely the trip of a lifetime if you like wildlife. It would be a great place for a honeymoon – although you have to accept that a boat cruise is very intense and you are with other people the whole time. We didn’t really have much time to relax. I think the people on the boat are very important and you never know what you will get ! Also be careful what time of year you go because there is a definite rough season and it would be no fun to be seasick the whole time ! 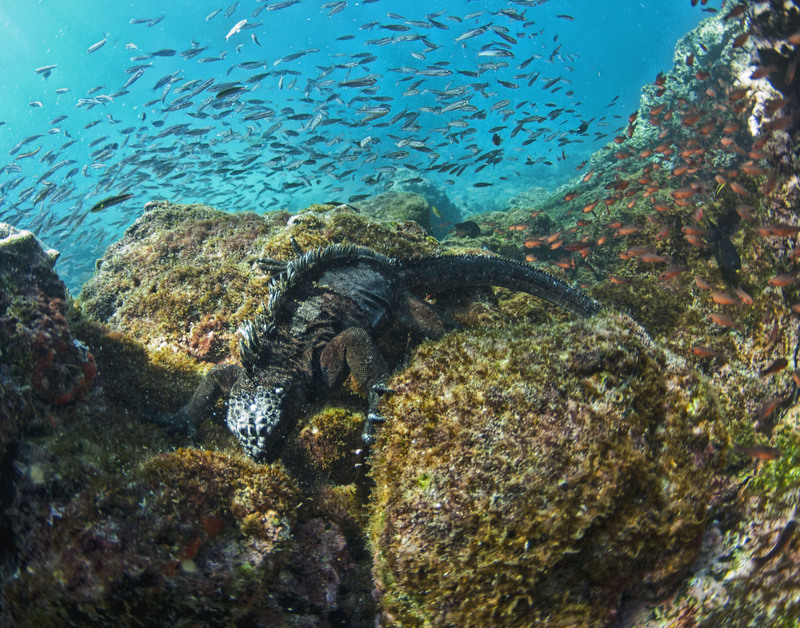 I’d love to use use your picture of the marine iguana feeding on a small educational jigsaw for kids… would you mind? It is fine to use the picture – as long as it is non-commercial. I’m Micki from TheBarefootNomad.com travel blog. 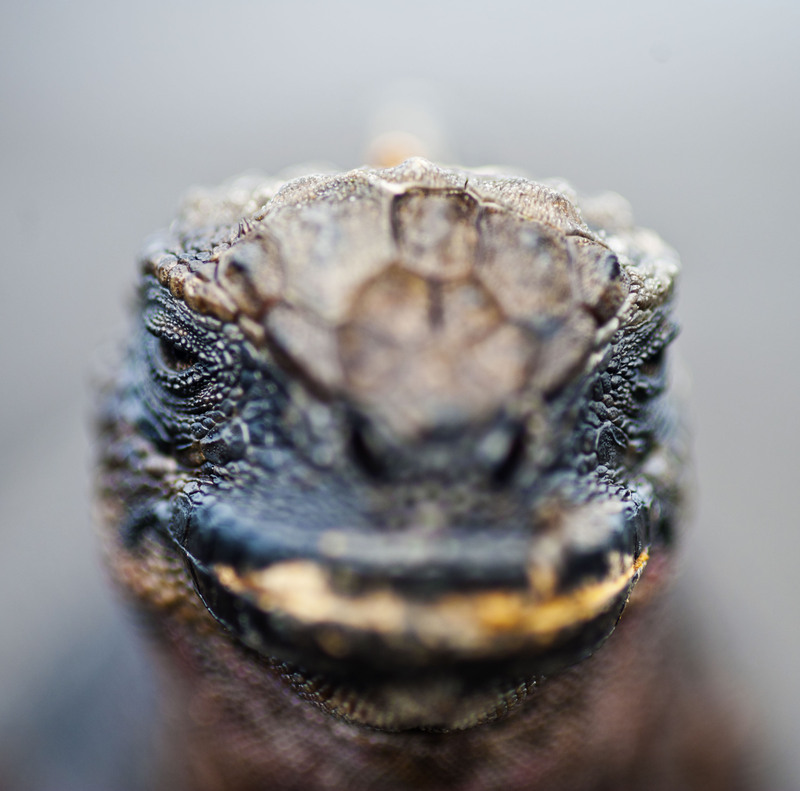 I’m writing a blog post about Galapagos travel inspiration. 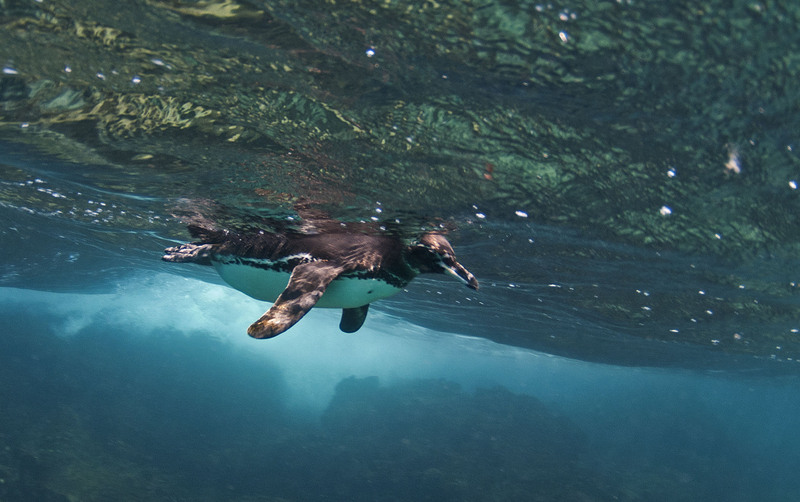 I would love to use two of your photos in the post (the Little penguin under water and the penguin on the surface). Would that be OK? We’re a personal blog. Of course, we’ll give full credit for the photos and a link back to to your site. You can of course use a couple of my pictures with a credit and link back. Brilliant photos. Reminds me of my time there although we didnt see as much activity in the water in November. And my photos aren’t half as good.